Mangos are cultivated throughout various regions of the world. There are many varieties that are used in chutneys, salsas, or simply eaten raw. They are a delicious and versatile fruit, and very refreshing in the summertime. In several cultures, its fruit and leaves are ritually used as floral decorations at public celebrations, and religious ceremonies. Recently, I participated in an event on Facebook, that required the use of mangos, as an ingredient. Of course, I had to get involved, and decided to make a quick and easy salsa. This dish can be eaten by itself, with tortillas, or over white fish. I have used it on cod-fish, and it came out delicious. Combined all the ingredients and chill in the fridge for at least an hour. When I lived in New Jersey many years ago, my uncle used to have a zucchini garden in the summertime. He often made Stuffed Zucchini Blossoms, and I always enjoyed them. He also put them in scrambled eggs. Since then, I moved to South Florida, and could not find them anywhere. On occasions, I would enjoy some, at a nearby Italian restaurant, but I always wanted to make it in my kitchen. Recently, my son PJ told me, he knows someone who’s growing zucchini. I screamed on the top of my lungs, and told him to get me some. Well, he came through for me, because today he brought me a nice amount of them. Needless to say, I was ecstatic. Since I’ve never made them, I sought the assistance of some amazing friends who guided me in putting this recipe together. Giusy gave me the ratio for the beer and flour batter, and Angela suggested to make them the traditional Roman style, with fresh mozzarella and anchovies. It was a MAJOR HIT! Serves: 4-8 Total: 15 zucchini flowers, keep them in a cool place so they don’t wilt. Level of difficulty: Medium, because it takes a little time, and you have to treat them gingerly. 1) With a dry paper towel, gently clean the flowers. Remove the stamens, (pollen inside the flower) DO NOT ATTEMPT TO WASH THEM, YOU WILL BREAK THEM. 2) Stuff each flower with a dollop of mozzarella cheese, (about 1 teaspoon or so depending on their size) and 1/2 of an anchovy fillet. Squeeze the top of the flower gently to close it. It will not be perfect, don’t worry about it. The batter will protect the stuffing while cooking. Set aside. 3) Prepare the batter, by combining the flour with the beer. Season with salt and pepper to taste. Mix well with a whisk until you obtain a creamy texture. 4) In the meanwhile, pour oil to cover the bottom of a frying pan, heat up on medium-high heat. Gently place the zucchini flowers in the batter, making sure, they are coated well. ( I did them in batches) and drop them in the hot oil. It will be messy, and it’s ok, just have confidence. Cook on one side for about 2-3 minutes, lower flame, if it’s too high, you want them light golden brown and not dark brown. Cook other side for another 2 minutes. Remove promptly. Serve at once. They will literally melt in your mouth. If you don’t like anchovies, then omit them. (sorry, but you will miss out). My family went bananas over this stuffing. You can also stuff them with ricotta cheese, and use club soda instead of beer, for a lighter batter. Please keep in mind a recipe is to be used as guideline, it’s up to you, the homecook, to watch the food, and use your judgement. Adjust the temperature setting as necessary. When frying, always make sure the oil very hot, otherwise, the food will come out soggy, and not presentable. This batter can be used to fry some veggies such as zucchini and cauliflower. The choice is yours. I hope you will have some fun in your kitchen, and try this delectable recipe. Good evening all! I hope you are ready for some fun in Gina’s Kitchen. Tonight, I prepared Clams Oreganata and I am happy to share this recipe with you. They were so delicious, my family devoured them one by one. In a colander, wash the clams thoroughly and place them on a flat baking tray. I will share with you a little trick to make it easier to open them. Preheat oven at 375 degrees and bake the clams for 3 minutes. They will be open, just detach them one by one so each clam is on one shell. Do this while they are still on the tray. There will be some juice from the clams, leave it in there. Set aside. 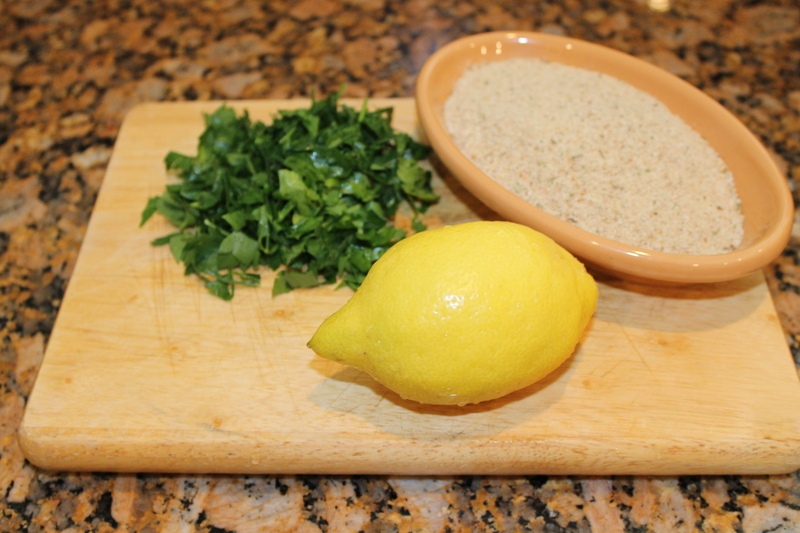 In a small bowl, mix the breadcrumbs, parsley, oregano, black pepper and olive oil. Sprinkle this mixture on top of all the clams and cover the tray as well. Place in the broiler for 3 minutes and remove promptly. They should have a nice golden color to them. Drizzle liberally more olive oil, and squeeze the lemon juice all over the clams. Voila! They make a fancy appetizer but do require a little work. They are so worth the extra effort, your guests will be very satisfied. If you choose to drink, I would pair it with a nice Chardonnay. Good morning all! I am still very excited about blogging and hope more of you will join me on my new journey. I have debated what to post, since I have a nice collection of recipes in my database. Today, I decided to share with you my popular Hummus recipe. It’s always a big hit at my gatherings and so easy to prepare. Combined all the ingredients (except for the paprika and garnishes) in a food processor or blender until it reaches a creamy texture. Add more water if needed. Place in a medium size bowl, garnish with olives, parsley, sprinkle the paprika and drizzle some olive oil on top. Chill in the refrigerator for at least an hour. Voila, you got yourself a crowd pleaser! Serve with Pita bread.